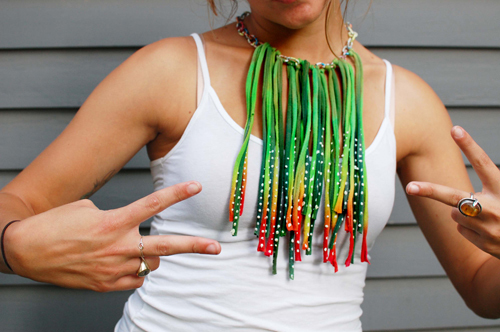 It's that time of year to sport your brightest jewelry and I have something fun to show you. Of course it's great to buy things at the store but you will never find anything that fits you perfectly. You know what I mean, your favorite colors, style, shape and so on. 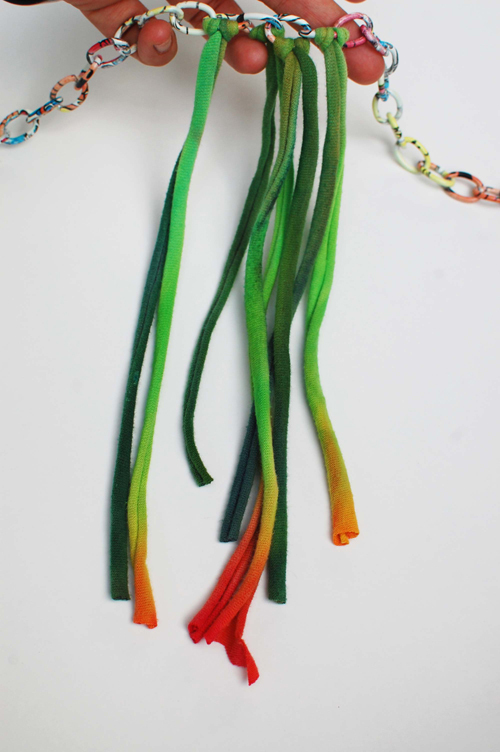 That's why today I will show you how you make your very own tie dyed fringe necklace. 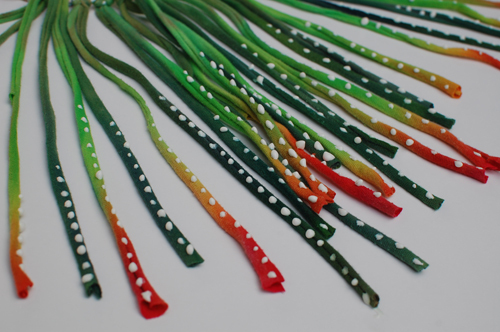 I love this craft for the simple fact that you can make it how you want with your favorite colors. Let's get started. 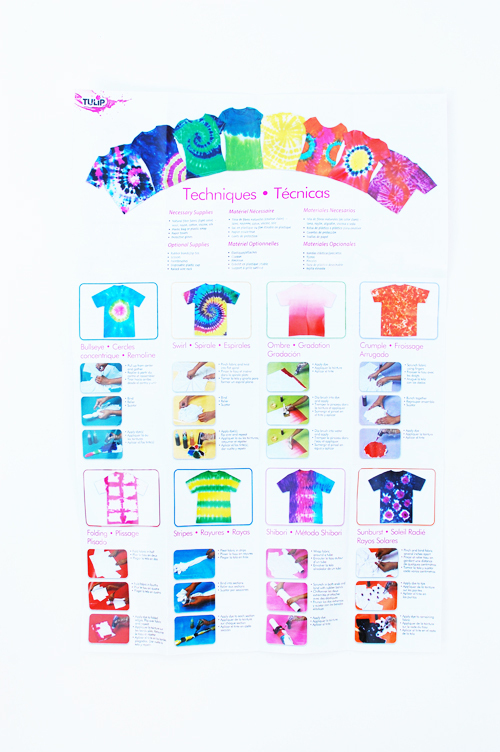 Here are some of the different ways you could tie dye. 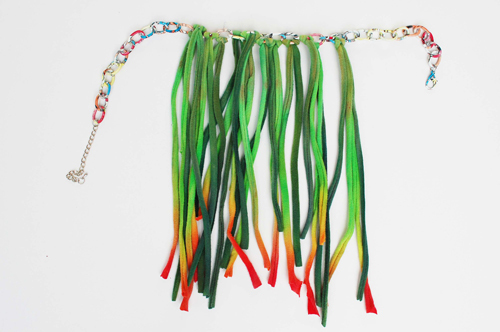 For this necklace you could use any design because in the end you will have strips of fabric and the design won't be that obvious. This is what comes in your standard 5 piece set. 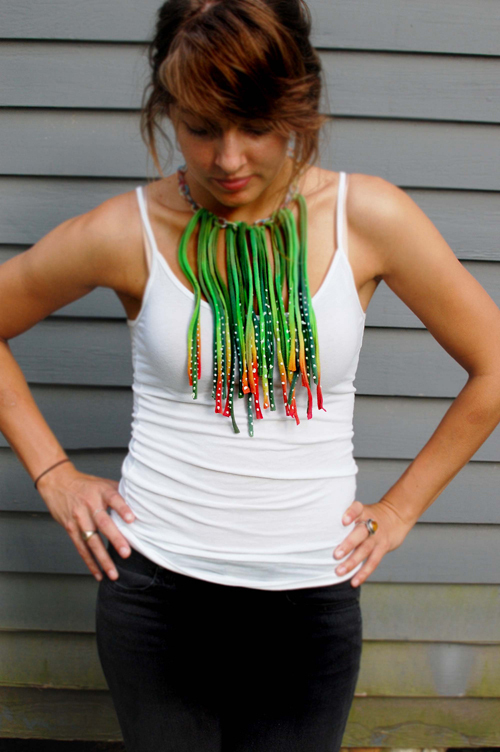 I tie dyed a ton of white shirts with different colors so I would have different options for my necklace. Just have fun with your design. I love scribbles fabric paint. 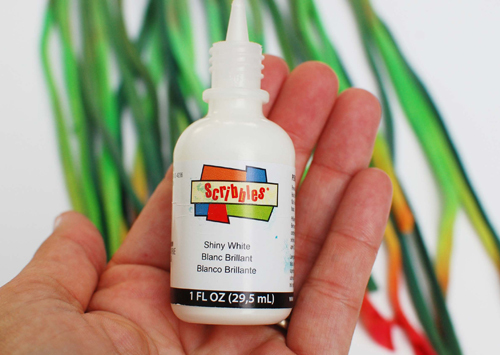 This paint surely brings me back to my childhood! I recommend doing your shirt the day before you do the necklace. 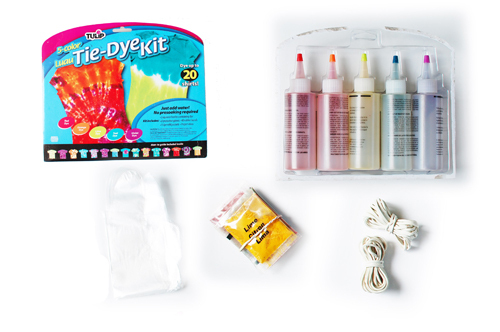 If you have never tie dyed you could check out this tutorial. It's so easy and you will have so much fun. First thing you will do is lay your shirt out flat on a surface you can cut on. I put my shirt inside out just so you could see the seams. 1. Cut the bottom part of the shirt off. 2. Cut the top portion of the shirt off. I cut right below the arms, horizontally. 3. You will have a tube portion of your shirt now and two seams, on the left and right. 4. Pick a side you want to start on and cut the shirt into strips. Remember earlier when I said I dyed ton's of shirts. Here is another one that I made. 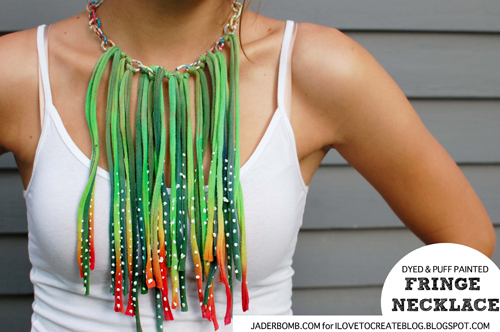 I wasn't sure what kind of mood I would be in when I made the actual necklace so I wantet options! I actually decided to go with the "OMBRE" rainbow shirt. 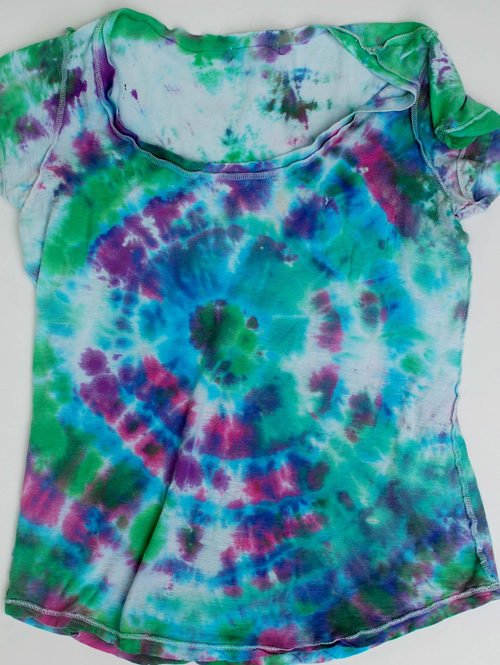 To do this, all I did was lay a shirt out flat and gradually add different colors from the bottom of shirt to the top. When I do this I like to add red next to yellow so I can get shades of orange. 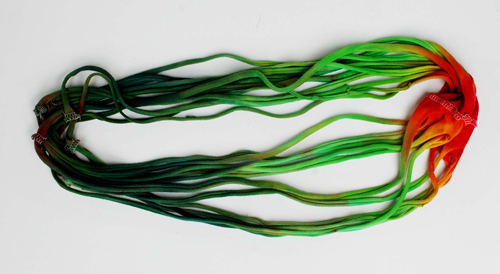 You can also put yellow next to green to get shades of lime green. It's so fun! Once you cut your strips you will have the seams left. Take your fabric scissors and cut the seams off. There is no right way to do this because in the end all we want is tiny strips of fabric. 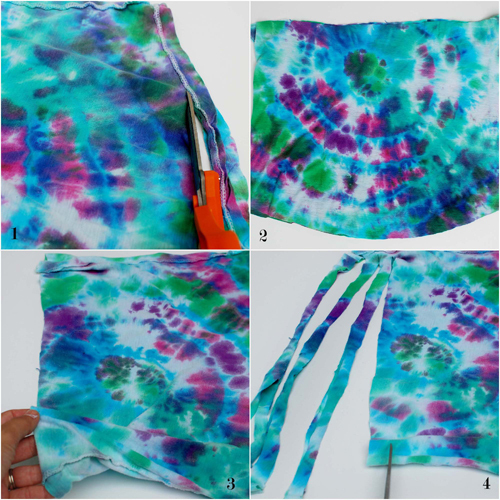 Pull the strips with so your fabric will curl. On to our next step. Get your chain necklace out. 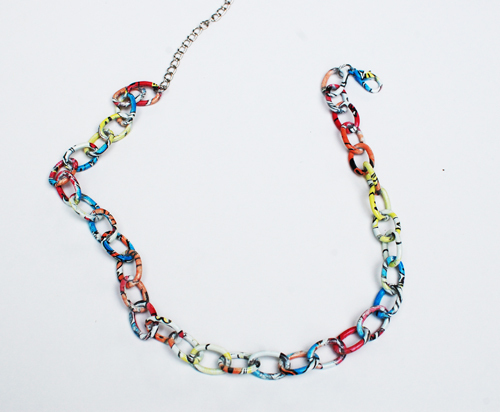 We are using a chain link necklace because we need the holes to pass out fabric through. 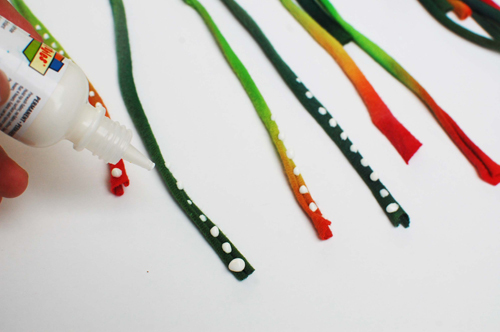 Cut your strips into the length you want and put the two tips together. 1. Pass the loop through one of the chain links. 2. Pull it through. The loop will be at the top now. 3. 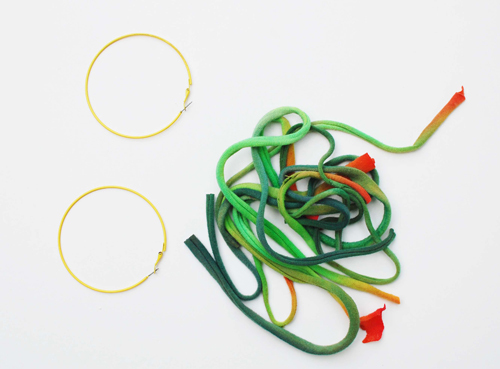 Take the two pieces at the bottom of link and pass it through the loop. 4. 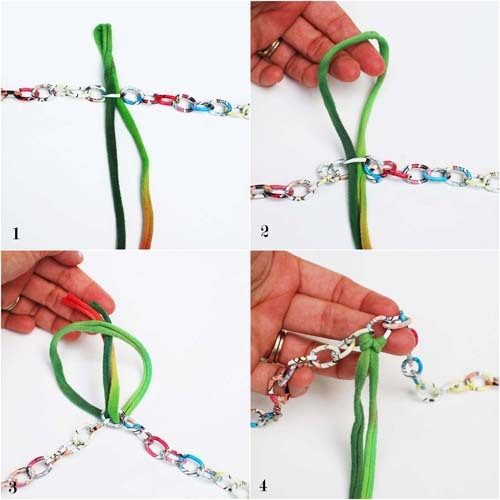 Now pull the two strait pieces downward to create a secure knot. This is what it will start to look like. OK! I am seriously in love with these colors. I can't wait to wear it with a white tank top. The colors will POP like crazy! 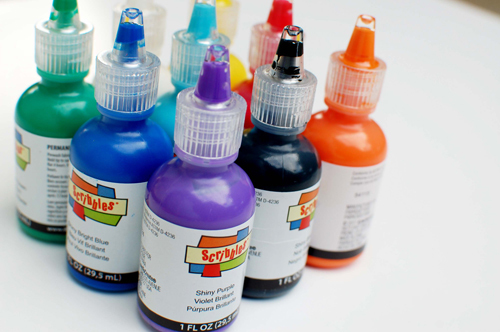 Pick your color of fabric paint. I am using white so my dot's look like pearls. I only put them on the tips. 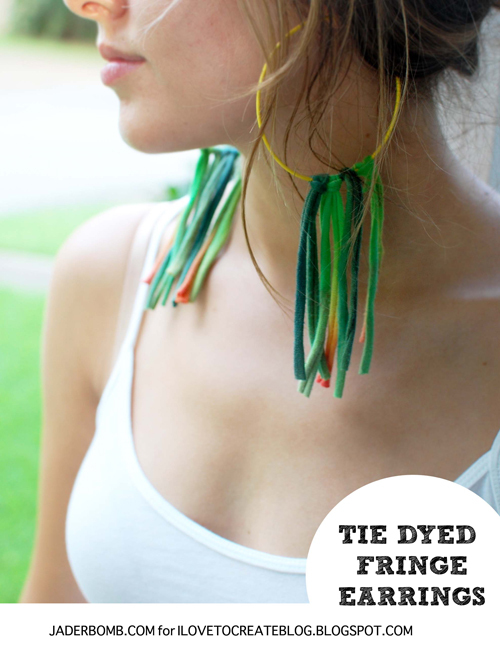 If you have left over fabric strips you could make fringe earrings! Using the same steps. I didn't put pearl dot's on these. They are so cute! I would not recommend wearing the necklace and earrings at the same time. It might be a little too much! You could give this as a gift to someone or make 10 just for you. Remember you can make this as short or long as you like. 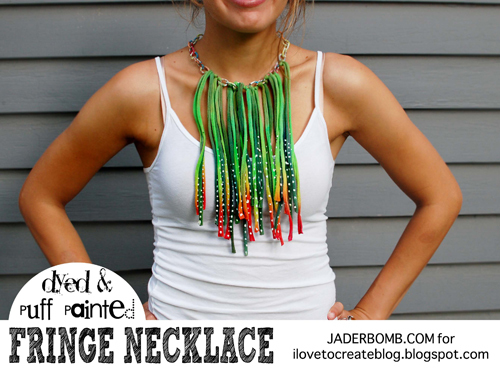 I had so much fun making this necklace and I know you will too! I love how you can make it whimsical or classy in 5 minutes. Huge hugs from my craft room to yours! See you soon. P.S. 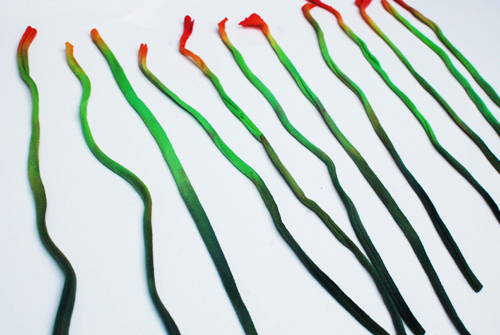 I promise when you start playing with Tie-Dye you won't be able to stop, he he! P.S.S. 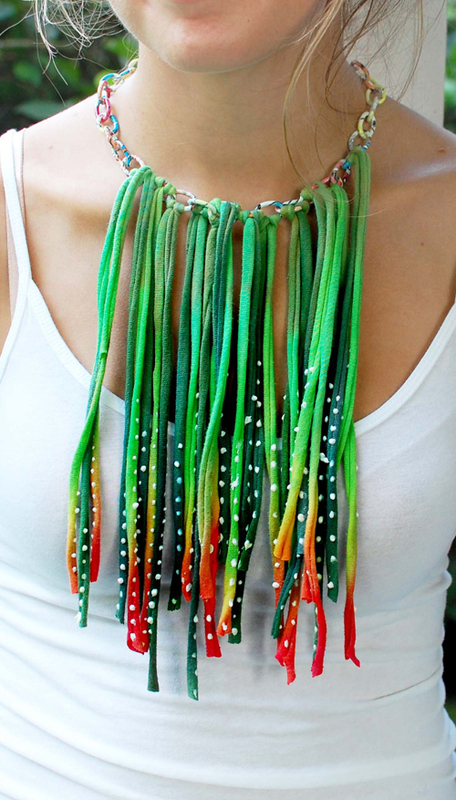 What colors would you use for your necklace! I absolutely love this!!! What a fun, different and totally unique idea!!! 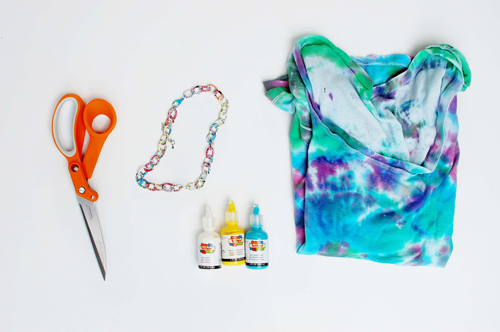 Would never ever thought of making jewelry with tie dye!! I love thinking way outside the box!!! AWESOME!!!! Oh, Really very good site. I am very excited nice this article. Many man easily help for this site. You can suggest for all guys. There are many kind facility in this site you can visit this site. ok thanks for your nice article. I can not for get you. If I were not a seasoned crafter, I would be confused by the materials list and instructions. It sounds like I would be dying a dyed shirt. Waste of time, energy, and supplies.